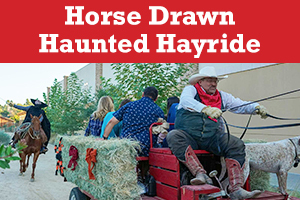 It’s a traditional horse drawn wagon ride and a spooky Halloween experience all in one! Take a special adventure along a route that just might be haunted by the Headless Horseman! The wagon seats approximately 8 people and is drawn by a team of working draft horses along a scenic path and spooky sites. Carriage riders listen to an animated story narration of the Legend of Sleepy Hollow, and while the ride is family-friendly, the experience gets a bit scarier the darker it gets. Reservations are required for rides from October 13th to 31st. Have some Fun and Get Lost in the Temecula Corn Maze! 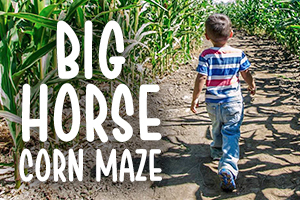 Don’t miss tons of family fun at the annual Big Horse Corn Maze and Harvest Festival in Temecula. Explore Southern California’s largest corn maze, plus festivities that include pony rides, hayrides, pillow jump, rock wall, face painting, zip line and more! There will also be hoola hoop and pie eating contests, pumpkin bowling and other great activities. Make sure to stop by the pumpkin patch to find your favorite! The festival runs through October 30th.